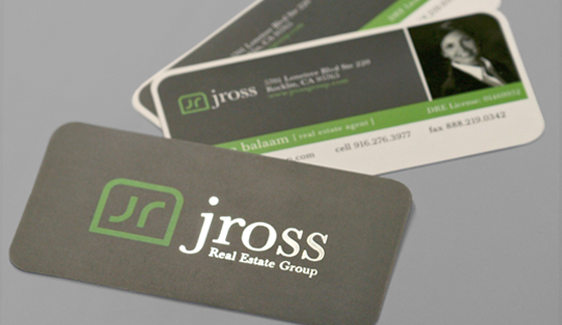 Adding rounded corners to business cards is part of the die-cutting process. It's the first step, taken right before the design is printed in full color. Die cutting includes rounded corners, but also involves any hole punches or custom shapes. Once the laser cutter performs the die cuts, the printing takes place, followed by any and all custom upgrade enhancements. This is where things like decorative color foil and spot gloss highlighting take place. 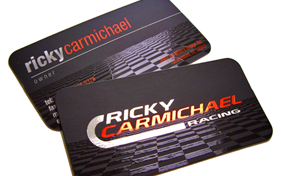 Ordering business cards with rounded corners is simple and enhances the look of any business card. 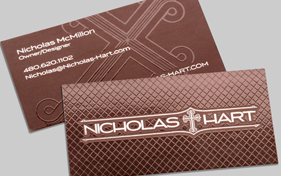 The average business card has sharp corners which can be unattractive and may portray an uninviting image. Rounded corners add a certain stylish flare to any full color printed piece, and will set your satin business cards apart from the competition. Overall, it gives a very distinguished look that will impress any prospective customer. Die cutting is a process that includes many different options. It can be used to create rounded corners, which can also help to avoid corner fraying. Business cards can also be cut to make just about any shape imaginable. Likewise, shapes can be punched out of the card stock in many designs/sizes. All this is applied before the 4/4 color printing and silk laminating processes take place. 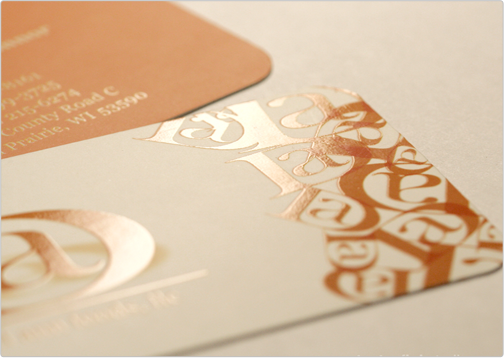 When combined with other great custom upgrades like spot gloss and decorative color foil, rounded corner die cutting can amplify the style and appeal of any silk business card design. Taste of Ink is a specialty design and full color printing firm. We are highly specialized in the uses of silk laminates, and the application of spot gloss, color foil stamping, and laser die cutting. Our design and print experts can help you determine what custom upgrades will give your business card design the perfect image for your company. Be sure to request our sample packet to see and feel for yourself the effects of unique and classy custom options available when ordering printed material through Taste of Ink.